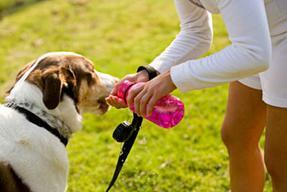 At Pet Sitter San Diego we realize that your pets are a precious part of the family and deserve to be treated as such. We pledge to care for your furry loved ones as if they were our own. By offering pet sitting in the comfort and security of YOUR home, we believe that stress levels and separation anxiety will be reduced, diet and exercise routines can be followed without interruption and health concerns about kennel boarding will be eliminated. And, best of all, you can relax and enjoy your time away knowing your pets are receiving individual attention and lots of TLC! In addition, for the working parents or those unable to exercise their dogs on a regular basis, we offer dog walking services. With regular exercise your dog is less likely to demonstrate elimination problems and destructive behavior inside the home. A tired and well-exercised dog is a happy dog. I just got home and you took great care of the pups! Thank you so much! You will come highly recommended by me to anyone I know who needs a pet sitter! Thanks so much for watching Mimsy as well as the report and the email update! She really enjoyed your company - I could tell by how relaxed and happy she was when I got home. She loved all the playtime and attention you gave her. I’m very thankful to have someone as special, kind and reliable as you to help me with my doggies….You are wonderful!